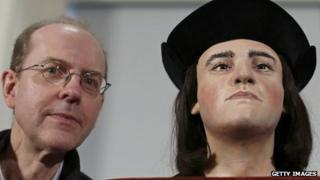 A facial reconstruction based on the skull of Richard III has revealed how the English king may have looked. The king's skeleton was found under a car park in Leicester during an archaeological dig. Historian and author John Ashdown-Hill said seeing it was "almost like being face to face with a real person". Richard was killed in the Battle of Bosworth in 1485, at the age of 32 and after just two years on the throne, having been challenged by the forces of Henry Tudor, the future Henry VII. Dr Ashdown-Hill, who wrote The Last Days of Richard III, said: "The most obvious features in portraits are the shape of the nose and the chin and both of those are visible in the facial reconstruction." Richard III Society member Philippa Langley, originator of the search, said on a Channel 4 documentary earlier: "It doesn't look like the face of a tyrant. I'm sorry but it doesn't. "He's very handsome. It's like you could just talk to him, have a conversation with him right now." Dr Ashdown-Hill said: "I had said previously that when I stood by the grave in Leicester that I felt closer to Richard III than I had ever been, but when I saw the facial reconstruction I realised I had been close to a dead Richard III. "It was just bones, just a body, whereas confronting a facial reconstruction, I felt almost in the presence of a living Richard III." The reconstruction is particularly important because there are no surviving contemporary portraits of Richard III. Dr Ashdown-Hill said: "All the surviving portraits of him - even the very later ones with humped backs and things which were obviously later additions - facially are quite similar [to each other] so it has always been assumed that they were based on a contemporary portrait painted in his lifetime or possibly several portraits painted in his lifetime." The Richard III Society officially unveiled the reconstruction on Tuesday morning, at the Society of Antiquaries in London. It is expected the reconstruction will be put on public display in future. Experts from the University of Leicester said DNA from the skeleton matches that of a descendant of Richard III's family. Dr Ashdown-Hill said: "We weren't certain whether the body was Richard III so the facial reconstruction - particularly if it hadn't been possible to get DNA from the bones - might have been an additional piece of evidence, and still is." Caroline Wilkinson, professor of craniofacial identification at the University of Dundee, said: "It was a great privilege to be able to analyse a skull thought to be Richard III. "The facial reconstruction was produced on the assumption that the remains were unknown and portraits of Richard III were not used as reference. "When the 3D digital bust was complete it was replicated in plastic using a rapid prototyping system and this was painted, prosthetic eyes added and dressed with a wig, hat and clothing." Prof Wilkinson said the Dundee team artist, Janice Aitken, only used the portraits of Richard III at this stage as reference for hair style and colour, eye colour, skin colour and clothing. The team estimated the end result was as accurate as possible. "Our facial reconstruction methods have been blind tested many times using living subjects and we know that we can expect that approximately 70% of the facial surface should have less than 2mm of error," said Prof Wilkinson.